HARRISBURG, Pa. – The Clarion River has been nominated as one of four waterways across the state vying for 2019 Pennsylvania River of the Year. On Tuesday, Gov. Tom Wolf encouraged the public to participate in the annual contest by casting an online vote. Waterways nominated for 2019 are the Clarion River, Conodoguinet Creek, Delaware River, and Lackawanna River. Nominations consider each waterway’s conservation needs and successes, as well as celebration plans if the nominee becomes 2019 River of the Year. In cooperation with DCNR, selection of public voting choices is overseen by the Pennsylvania Organization for Watersheds and Rivers (POWR), an affiliate of the Pennsylvania Environmental Council. The public can vote for a favorite state waterway beginning today through 5:00 P.M. on Friday, January 4, 2019. The website www.pariveroftheyear.org enables voting and offers details on nominated waterways and the River of the Year program. Presented since 1983, this year’s 2018 winner was Loyalsock Creek. After a waterway receives the annual honor, local groups put in place a year-round slate of activities and events to celebrate the river, including a paddling trip, or sojourn. The organization nominating the winning river will receive a $10,000 leadership grant from DCNR to help fund River of the Year activities. The River of the Year sojourn is among many paddling trips supported each year by DCNR and POWR. An independent program, the Pennsylvania Sojourn Program, is a unique series of a dozen such trips on the state’s rivers. These water-based journeys for canoeists, kayakers and others raise awareness of the environmental, recreational, tourism and heritage values of rivers. 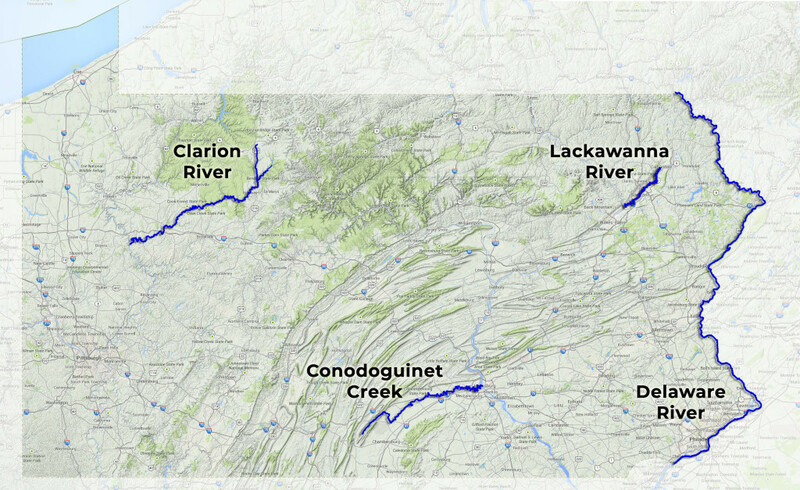 For more information about the sojourns, visit the Pa. Organization for Watersheds and Rivers website. To learn more about DCNR’s Rivers Program, visit the DCNR website (go to “Conservation” and click on “Water”). For details on the River of the Year program, visit the Pa. River of the Year website.